Harry Gibbons | Tommy's Footprints…..
Steppingley is a small, quiet village surrounded by farmland which is part of the Duke of Bedford’ Woburn Estate. In 1914 the Duke established the Bedfordshire Training Depot in nearby Ampthill Park. Steppingley boys heeded the call and were among the first enlist. Six men are named on the brass WWI Memorial Plaque in St.Lawrence’s Church, Steppingley. Four of these trained at the Ampthill Camp. Most of the boys lived in the Duke’s Cottages along Rectory Road. On November 9, 1914 Thomas Rogers (Rabbit Warrener) and John Battams (Stockman) enlisted together with John’s younger brother, Walter Battams (Farm Labourer). They were given consecutive service numbers. Harry Gibbons (Farm Labourer) enlisted the very next day and was assigned 17743. The four Steppingley boys would have known each other well. They joined the Ampthill Camp when it first opened and would have used the Warren Woods entrenching ground. In June 1915 the soldiers were drafted to the Front. Arthur Norris (Railway Porter) joined in January 1916 and was assigned the service number 27675. The 1911 Census shows Arthur residing in Lower Stondon where he had gone for work. The boys served with the Bedfords’. However, little is known of the specifics because 30 years later many of the British Army service records were destroyed in the Blitz. John Battams trained with No.1 Company at the Ampthill Camp. We know that Private John Battams saw action on September 25, 1915 with the 2nd Bedfords’ at the Battle of Loos. This was the first time that the British Artillery used gas. Sadly, on the first day of battle John (22) was killed by a shell during the British attack on Hulluch. In November 1915 the Battams family attended a memorial at St.Lawrence’s Church. The flag flew at half-mast. John is remembered in Steppingley Church and on the Loos Memorial. 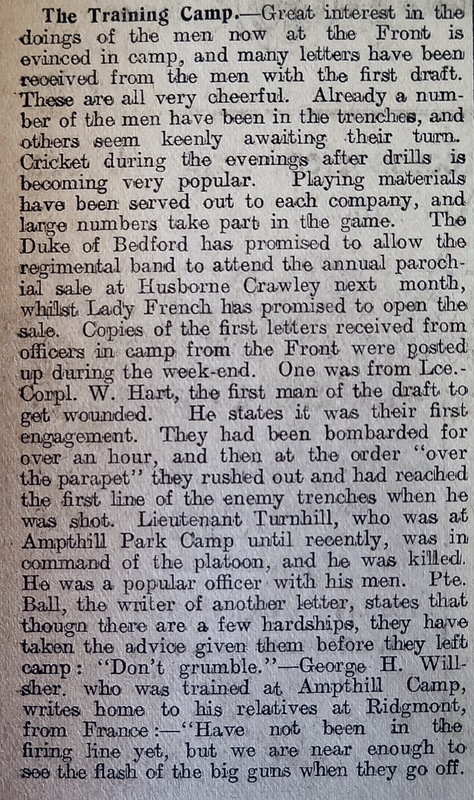 Walter Battams trained with No.1 Company at the Ampthill Camp. Following training was posted to 2nd Battalion Bedfordshire Regiment. Walter was injured at least twice and gassed. On June 14, 1916 Walter sustained an injury to the tissue of left hand and was admitted to 1st Service Hospital Rouen – discharged to base depot at Harfleur on June 28, 1916. In May 1918 he was gassed and then on August 7th Walter was shot in the neck. Walter’s conduct record shows that he was a gallant fellow who was brought to notice on a number occasions. On June 7, 1917 Walter was awarded the Military Medal his brave actions during the taking of Messines Ridge, and in August 1918 was awarded a Bar to the Military Medal. To place Walter’s actions in context only seven of 707 men named on the Duke of Bedford War Memorial were decorated with the Military Medal. Thankfully, Walter survived the Great War and was demobilized in April 1919, returning to Steppingley. In September 1921 he married Kate Oliver. Kate (52) died in 1950 and is buried in St.Lawrence’s graveyard. In 1983 Walter (88) was buried alongside. Captain Frank Sloan MC, one of the training staff at the Ampthill Training Depot, was also posted to the 2nd Battalion Bedfordshire Regiment. He was present at the battle for Trones Wood and later wrote to the Duke of Bedford describing aspects of the battle. Sixteen Ampthill recruits who were killed that day – more. Thomas (34) was one of the casualties. He left a wife, Fanny, and three young children, Mabel, Horace and Ruby. After Thomas was killed the family wore black for 6 weeks to mourn his death. Thomas is buried in the Dive Copse Cemetery and remembered in Steppingley Church. 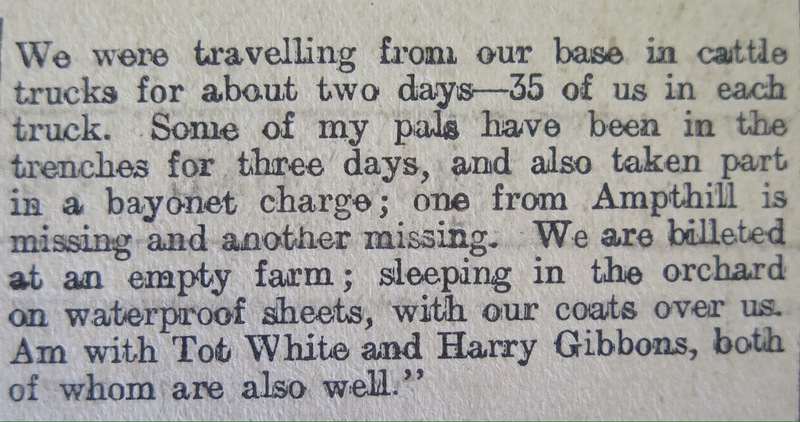 In 1914 Arthur Norris was living away in Lower Stondon. 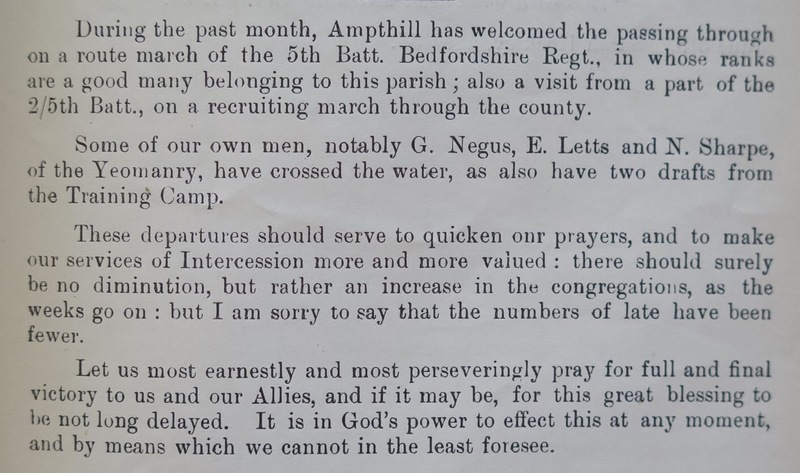 On January 26, 1916 Arthur joined the Ampthill Camp and was posted to No.3 Company. On completion of training he was drafted to join the 4th Battalion Bedfordshire Regiment. We know that in April 1917 Arthur sustained gun shot wounds to the left leg and was admitted to hospital in St Omer. Arthur recovered and was returned to active service. Serjeant Arthur Norris (23) served with in the 4th Bedfords’ at the Second Battle of Ypres and on October 30, 1917 was killed in action. Arthur made Battlefield Will leaving his money in the Post Office Savings Bank and all of his possessions to his mother, Kate Norris, of Flitwick Lodge. Arthur is remembered on the Tyne Cot Memorial, in St.Lawrence’s Church and on the Flitwick War Memorial. We know that Private 76192 Harry Gibbons was with the Middlesex Regiment before he joined the Bedfords’. Harry was given a new service number, 17743, and was at the Training Depot for nearly seven months, assigned to No.1 Company. On June 9, 1915 he was posted to the 2nd Battalion Bedfordshire Regiment in France. Whilst with this Battalion he was admitted to hospital twice. The first time Harry was suffering with bronchitis. On September 3, 1916 he then received a gunshot wound to the back. On his return from hospital in Bologne Harry transferred to the 4th Battalion. Harry went into battle at Moeuvres, France, during the Hundred Day Offensive in 1918. On September 27th the Allied Forces advanced towards the Hindenburg support Line – the last major defensive position taken up by the German Army in the war. In capturing their objective Corporal Harry Gibbons (23) was killed. He is buried at Moeuvres Cemetery – more. Two other Steppingley boys are named on the memorial plate in St.Lawrence’s Church. Herbert Brightman lived at No. 57 Duke’s Cottages, Steppingley. His trade was a Hatblocker. Herbert attested on May 11, 1916 and joined the Royal Fusiliers (London Regiment). We know that a H.Brightman trained at the Ampthill Camp but this is a different soldier – 23316 Private Herbert Brightman – who came from Dunstable. Private Herbert Brightman (29) was killed in action on March 28, 1918. Herbert is buried in the Mesnil Communal Cemetry, France. Stanley Warner lived at No.31 Duke’s Cottages, Steppingley. He was a farm labourer. Hector attested on September 27, 1916 and joined the Sherwood Foresters (Nottingham & Derby) Regiment. We know that Hector served with the 24th Battalion. Private Hector Warner (20) was killed in action on October, 17 1918 just three weeks before the Armistice. Hector is buried in the Busigny Communal Cemetry, France. Thank you to Angela & Terry Hughes, Tony & Joan Rogers, Ian Church, Steve Fuller and Nicola Evans. This entry was posted in Soldier Stories, Uncategorized and tagged Ampthill Camp, Arthur Norris, Bedfordshire Regiment, Bedfordshire Standard, Bedfordshire Training Depot, Captain, Duke of Bedford, Flitwick, Frank Sloan, G/60786, Harry Gibbons, Hector Warner, Herbert Brightman, John Battams, Loos, Philip Thompson, Phillip Thompson, St.Lawrence's Church, Steppingley, Tom Rogers, Trones, Tyne Cot, Walter Battams, Woburn Abbey, WWI on September 26, 2016 by Ste H.